EcosimPro is a first class modelling and simulation tool for modeling 0D or 1D multidisciplinary continuous-discrete systems and any kind of system based on differential-algebraic equations (DAE) and discrete events. Although originally developed for space applications, namely to assist in the modelling of the Environmental and Control Life Support Systems (ECLSS) for European Space Agency (ESA)’s HERMES and COLUMBUS projects, due to the nature of its broad, wide-ranging capabilities it is now being used in many other fields. The first version of EcosimPro was released in 1993. 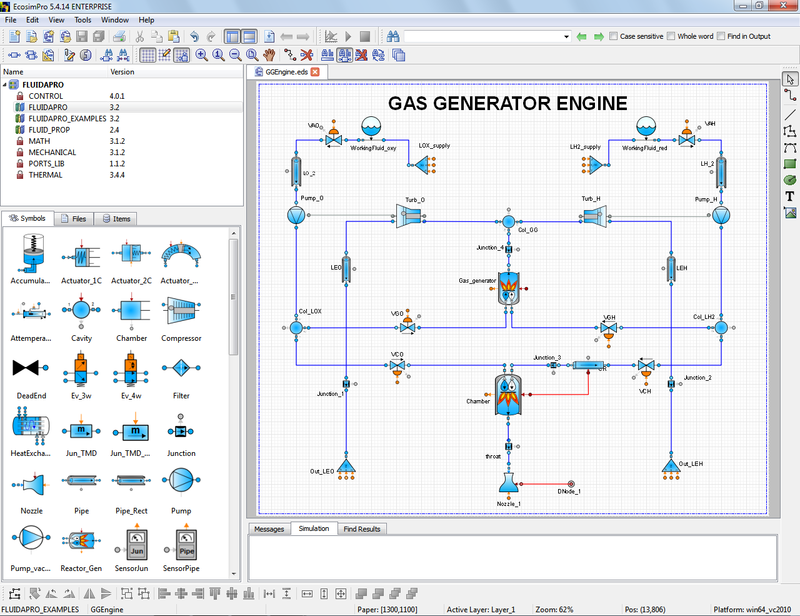 EcosimPro has been designed to carry out steady and transient studies, as an optimization and design tool that helps the engineer to improve any kind of system modeled with equations (0D and 1D). It also provides a highly intuitive graphics environment that facilitates its use in creating physical models based on schematic views. Engineers find it to be an extremely intuitive tool, since it has been designed based on real industry needs. Its GUI provides tools for creating easy to identify icons that represent components and which can be connected to other icons using ports of the same type. EcosimPro carefully extracts the complexity of the mathematical model and solves the final equations. The multidisciplinary libraries allow components to be created that mix disciplines such as mechanical, electrical, fluids, control, etc. 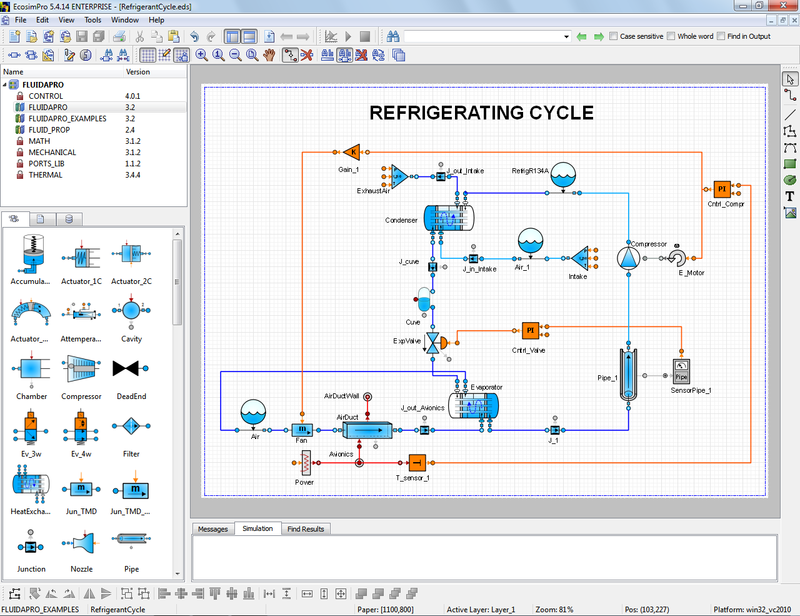 For advanced users EcosimPro provides an intuitive modeling language to guide the user through the process of creating new component libraries in a simple way. EcosimPro has internal symbolic and numerical algorithms for transforming the equations and solving them in the most appropriate way. The object oriented approach prevents having to re-code simulation applications every time you need to begin a new project. The user can mix causal and acausal equations and algorithms in order to find the most reusable and robust way of modeling your libraries. The components can use inheritance and aggregation to create more sophisticated components based on existing ones. This helps to reduce the complexity of the simulation models by sharing common behaviour. 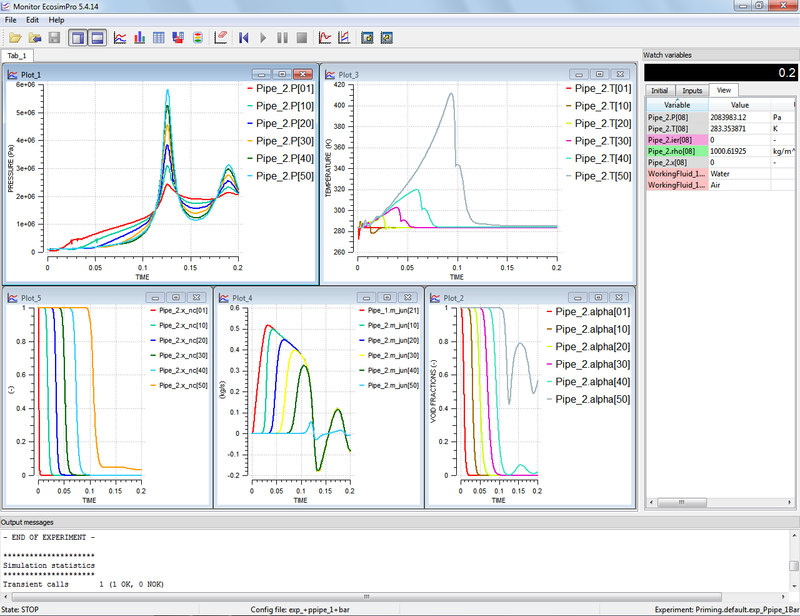 EcosimPro provides tools for simulating the models and visualize the results during the simulation using plotters, histograms, etc. Level 1: Developers of basic mathematical libraries. Level 2: Developers of simulation models reusing existing libraries. Level 3: Developers of different experiments on existing models. Easy to program new libraries: An easy to learn modeling language for the creation of new components and libraries. The language support causal and acausal approaches and allows the modeler to have a lot of flexibility and at the same time imposing some behavior when necessary. Its object orientation allows developing extendible and easy to maintain libraries. Furthermore existing C/C++ and FORTRAN functions can be called from the EL language and interaction with XML files is easy through the XML parser. Automatic creation of robust mathematical models: The symbolic mathematical kernel automatically extracts the mathematical model from the graphical schematic. The user selects the governing input variables (e.g. valves opening law) and the internal algorithms generate robust mathematical models through symbolic manipulation and equation re­ordering. The tool also allows selecting any iterative variables when non­linear equation systems are formed, and provides valuable information about the mathematical problem to be simulated by the solvers. Powerful solvers: The available internal solvers allow dealing with stiff or non­stiff dynamic problems, steady problems, optimization problems, use of constraints, etc. The solvers use dense or sparse version depending of the size of the problem in order to speed up the simulation. The algebraic problems are tackled by an improved Powell’s hybrid based method with sophisticated features as design tool. Convergence issues can be addressed with the help of the simulation log, in which the evolution of the variables, residues, Jacobians, simulation errors and statistics are summarized. Additionally, several optimisation solvers are also included, which enable undertaking parametric optimisation, dynamic optimisation, and system identification problems. 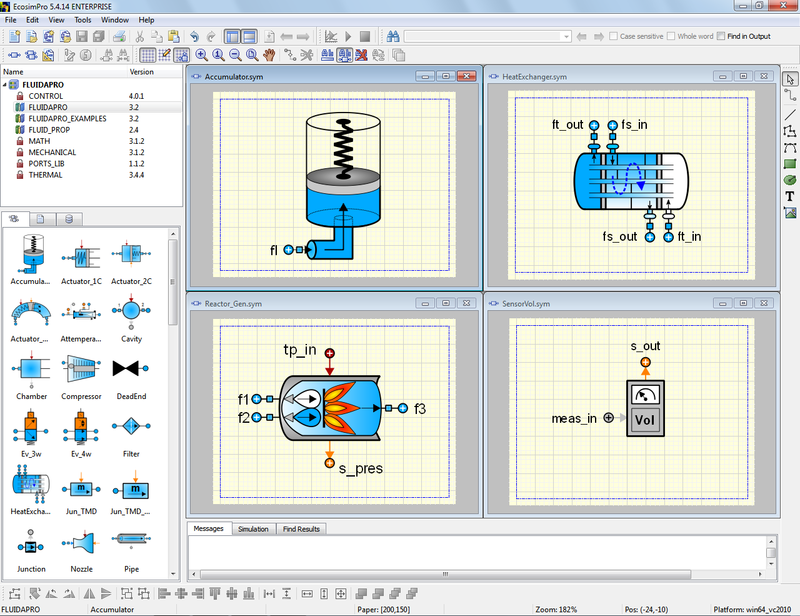 Connectivity with other engineering tools: Ecosimpro models may therefore be connected with other software (e.g. Matlab/SIMULINK, MS-Excel, ISIGHT, MS-Visual Basic etc.). Additionally EcosimPro models can also be translated into C++ code, which can be reused in other C++ applications. Export models as black box: Models and calculations can be encapsulated and encrypted in a stand­alone application (deck) with user defined accessible input/output variables. The deck can be used in command line mode, through a graphical user interface, or integrated into C or FORTRAN applications by means of standard interfaces. The deck exporting allows safe sharing of models between companies. 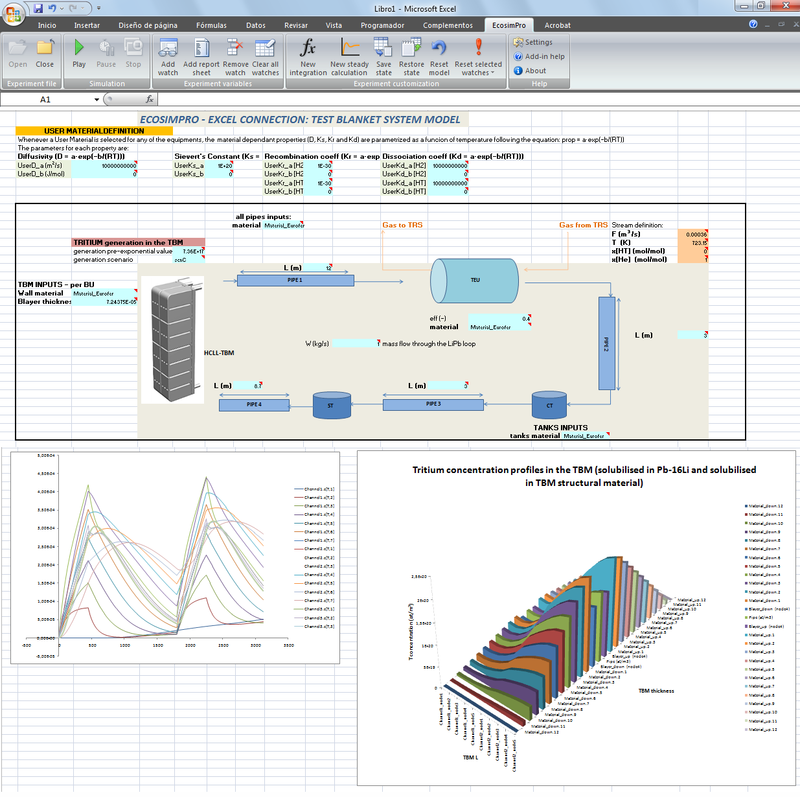 Running models from Excel: The user can run the models from EcosimPro but also from Excel. A toolbar has been created in Excel to configure stand-alone spreadsheets and to play the simulation from Excel. The user can input any data and visualize the outputs in real time. HDF5 format for data: All simulations can be stored in standard HDF5 format files and reuse later for post processing any simulation. 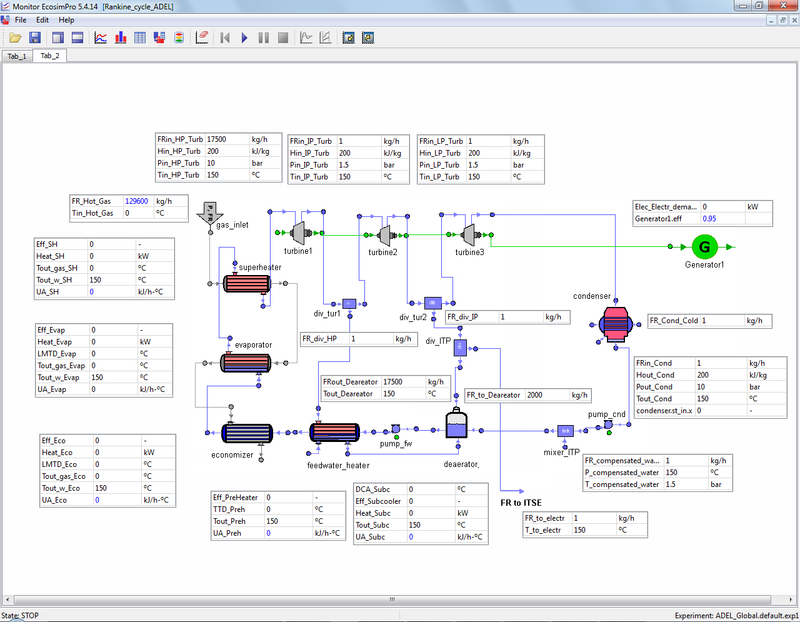 HIL and OPC standard: A model can also be exported ready to be used in a HIL (Hardware In the Loop) system through Simulink. Or it can be connected to SCADAs, other models or hardware using OPC standard. EcosimPro 3.0.0 Published in 1999. First commercial version. EcosimPro 1.0.0 Published in 1993. The development of this version began in 1989 within the framework of a contract with the European Space Agency.